Thank you Alan, Christine and Tracey, for a wonderful 3 weeks I had in the Dove Cottage. Your hospitality and kindness always exceeds expectation, which makes it very difficult to even think of looking for accommodation elsewhere. I must thank your staff as well, for cleaning up after me every day and for keeping the cottage neat and tidy. Good luck with your new tented units, which I am sure will also do very well because of your passion and commitment to ensure that your guests are happy. See you in the not too distant future. Very comfortable , friendly and peaceful lodge in natural surroundings. Cottages comfortable , larger units luxurious. Close to excellent Broadacres Spar for readymade meals & restaurants. Quick trip to Fourways mall for all shopping. Service excellent . I have stayed at Hoopoe Haven for my last 4 business trips to Jhb and have never once been let down. 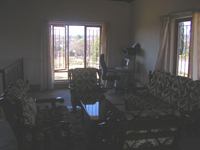 The accommodation is always neat and clean and the staff are always friendly. The place is very quiet and peaceful, yet you are only a stones throw away from the hustle & bustle. I tell everyone about Hoopoe Haven, because not only are there different accommodation options available, but also because Alan & Christine will go the extra mile to try and accommodate your needs. I shopped around and stayed at various places before finding Hoopoe Haven and to say that Hoopoe Haven is value for money, is an understatement. Highly recommended. Our stay in Hoopoe Haven guest house was so amazing, everyone from the cleaning staff where so welcoming and we had such a jol, our weekend was so awesome that we decided we have to come back in January ..we have a place where we can call home ...the house my word !!!! Heaven on earth .....ps A place to visit if u haven’t u won’t be disappointed ,keep up the good work amigos . Many many thanks for a delightful stay in your Cottage . Was JUST what we needed for our trips to and fro to the Dome ( Just LOVED the Birdlife - keep forgetting about the Biggest Treed City and its Birdlife) . - My son came to fetch me one eve and was suitably impressed - also agreed is far better for his clients to stay ( OUT of the built-up madness ). We had a wonderful stay in Piet-my-vrou cottage at Hoopoe Haven! We stayed before and after our trip to Botswana and it was no problem arriving incredibly late and leaving ridiculously early. The cottage itself was roomy, clean and warm during the cold winter nights. The grounds are lovely. Our kids loved their room in the attic and the pool. Due to family circumstances we had to leave early and Alan and Christine were so kind and understanding. They even gave us a refund, even though they weren\'t obliged to do so! Thank you so much, Alan and Christine! We hope to stay at Hoopoe Haven again some time. We had a thoroughly wonderful time staying at Hoopoe Haven. The cottage was roomy, clean and very comfortable. The grounds were amazing and perfect for our two children to play in. The staff were welcoming, helpful and friendly. We were in the area for a wedding and some of the other guests stayed at nearby hotels. In our opinion, there was no comparison; we absolutely stayed at the best place by far. Highly recommended! We recently stayed at the Swallow's Nest Cottage here at Hoopoe Haven Guest Lodge. It really was a wonderful experience. My husband was in South Africa to have surgery, so we wanted a convenient, yet restful place to stay while he recovered. We found it at Hoopoe Haven. My husband's surgery was delayed and we had to wait an additional two weeks before the surgery took place, so Christine and Alan accommodated our change in plans very graciously. The location of Hoopoe Guest Lodge is very convenient to malls, local sites and recreational areas. The location was perfect for our needs and made it so easy for us to run to the clinic when needed. We plan to discuss another stay at Hoopoe Guest House with our kids in the future. We feel that it has everything we need for a nice family vacation. WOW, thank you so much Alan and Christine for the wonderful reception and stay I had at Hoopoe Haven this past weekend. I don't think I have slept so peaceful in years.. From now on whenever I have to come to JHB I will definitely be staying with you again. Thank you so very much. Thank you Alan & Christine for the wonderful stay and for being so accommodating. Everything was top class and so comfortable. Lovely space for our farm kids to run around!! We will be back. I've stayed at Hoopoe Haven twice and will continue going there on my Johannesburg trips. Safe, affordable, comfortable accommodation that exceeds expectations. I absolutely love the quiteness and privacy that Hoopoe Haven offers. Its hard to believe you are actually in the city when surrounded by only nature. Will recommend Hoopoe Haven any day! Thank you for amazing, memorable stays and happy returns. We have had a very happy 9 nights here and enjoyed every minute, the girls were marvellous and very accommodative we will be back !! For those thinking of booking - Don't think! Just book! My second home - absolutely amazing - well done !! Just a small note to let you know what a fantastic time we had, many thanks to you guys and your staff. The lodge was so very clean and very comfortable. It really felt like home, although our home is not that peaceful and quite. My kids really enjoyed and are crying for us to come back. Please thank Memory and the rest of the staff for us. We are back again to the cold weather. Wish we had brought back a bit of some sunshine. You will be hearing from us soon be warned. "HOME, but then better! That's the best description for Hoopoe Haven! We stayed upon arrival from a long journey from Amsterdam, after visiting family in Mafikeng and then again before going back to Amsterdam. Great place for the kids and a quiet place. And that in Joburg!!! Thanks Alan and Christine and all the girls and we'll definitely be back whenever we are in SA again. Tot ziens, groeten van Eline, Tumelo, Lucas and Rosalie." "This has been one of our best trips to JHB and we can only think of this place that made it as we really felt at home and to wake up each morning with the birds singing in an a city that is busy all the time. You guys we friendly and the welcome we received on arrival is world class so thank u Alan & Christine and we will be back again. Chris and Sam and my 2 little girls. " "Wow, thank you very much for a very warm and wonderful stay at the Hoopoe, both my husband and my kids truly enjoyed our stay there, and we will certainly come again. " "Thank you Alan and Christine for making our stay so enjoyable. Your staff are fantastic and the omelette (with the secret ingredient) was delicious. Rowan and I were very impressed with the cleanliness and attention to detail in the bedrooms and communal areas. The gardens are beautiful and peaceful and we came back to Durban feeling relaxed and refreshed. We will be back!! " "I brought a group of 17 students from the UK to spend the a week in Johannesburg and the surrounds and get the full South African experience. I can not rate the lodge and the staff anything below excellent! We felt like we were visiting family, and the atmosphere and the surrounds made for a calm and beautiful environment. Located perfectly to straddle sights in and around Gauteng and further afield towards the Magaliesburg area. Everyone was warm, accommodating and friendly and the facilities and breakfast are superb! Thank you to everyone for the making my students' first trip to South Africa a truly wonderful South African experience :-) "
" We, my wife, daughter and son-in-law stayed here for 3 nights. we had a fantastic experience. the beautiful variety of birds and the different songs from these birds gave us added company. i would like to extend a very big thank you to Linda, Natasha and memory. they were absolutely fantastc. they are very welcoming with their beautiful smiles. they treated us like their family. we also want to hank our hosts- Alan and Christine. see you next time keep up the good work "
"As a single father living in Natal I have found finding the right accomodation for me son and myself in JHB hard to find. But in Hoopoe Haven it is a home away from home. From the hosts Christine and Alan to the friendly staff my stays have always been the best. While offering world class luxury to the stunning evening sunsets from the main verandah while having the braai going it feels like home. For my son there is ample space to ride his bicycle, run, swim, play on the jungle gym and even try his hand at pool. The gardens are pristine and the recycling of the waste water to irriagte makes it one of the very few \\\"eco-friendly\\\" places around. Bird life is adundant. I would recommend this place to business people and families alike as for business persons its a stones throw from JHB but offers the relaxation ones needs after a hard days grind and for families it offers you the space and a home away from home...."
"The dove cottage was an absolute treassure in a bird paradise, with warm and friendly reception from Allan and Christine. We had a wonderful stay and will always remember the friendliness and kindness, and recommend it to anyone. " "Alan and Christine, thank you so much for your wonderful kindness and hospitality during our fantastic stay at Hoopoe Haven. The cottage became our destination of comfort in the course of our 10-day stay. The peaceful location of the resort along with the wonderful surrounding views were mesmerizing, while the Swallows Nest cottage itself was a pleasure to call home during our stay. I also can't forget the generosity that you two (Alan/Christine) displayed to my mother and I and the fun we had together! Being amongst you two felt like spending time with family :-) We will certainly be coming back for another visit...Thank you! Brilliant service from Alan and Christine and their staff!! We spent two nights at this delighful place and received very personalised service from the ownersas we arranged trips to the nearest shopping mall etc. Our young daughters had a delightful time . Thank you very much Christine, Alan and team. We are definitely staying with you on our next visit"
It was a great holiday we had. Alan and Jones were very nice and hospitality. Linda and Natasha were always there to help us! A very peaceful place. Thanks a lot for everything! Look forward to see you soon!" Absolutley beautiful accomodation, central to where we needed to go and easy to locate using the GPS. The couple who run this were delightful. We stayed in the guest house, very comfortable and self contained which was nice. Would have been perfect if the Breakfast part had been up and running but am assured its coming!" Hoopoe Haven epitomises the serenity and peaceful surroundings that are necessary when one needs to get away from the hustle and bustle of everyday urban life. We were fortunate to have the entire place to ourselves for a whole week. Alan & Christine gave us the package for accommodation only, but went the extra mile to make tea, coffee, sugar, milk and breakfast cereals available as well. Just as well, because we were in Gauteng for an exhibition and had very little to no time to prepare meals. The beds are the ultimate in comfort and had me sleeping as late as I possibly could every morning we were there. We made full use of the nice hot showers, the DSTV facility as well as the lounge areas for late night recaps of the day's events. It was only on the Saturday of our departure that I really got to view the entire property in all it's beauty. I was so captivated I captured it all on video. (search for Hoopoe Haven on Youtube from end September 2009) I so wish we had gone there on holiday and not on a work assignment. But that leaves me with very little guesswork as far as accommodation goes next time I plan to stay in Gauteng." The cottage was our home for more than a month. Comfortable, well equipped, spacious with a charming thatched roof and a fabulous pool on the doorstep. The children loved the wide open grass area. The owners were friendly and made us feel very welcome. Close to several shopping centres and easy freeway access, yet with a l rural feel. I am sure you can hear the lions over the hill at Lion Park, a 10 minute drive away. Hopefully we will return to Hoopoe Haven one day. " "We were a family of 3 generations in Guinea Fowl Cottage and we ALL thoroughly enjoyed our time at Hoopoe Haven. Alan, Christine and their staff were most attentive without intruding. The accommodation was spacious, comfortable and spotless. Our children loved the swimming pool and large garden, and we all enjoyed the peace and quiet. 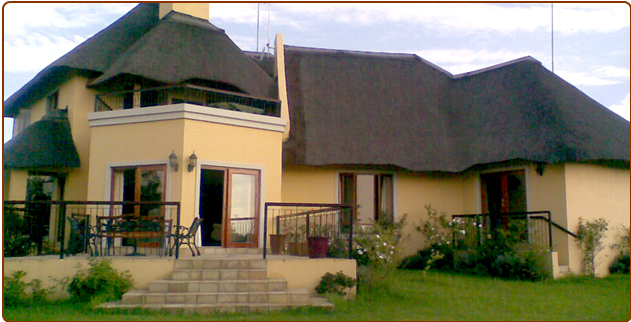 Hoopoe Lodge is our first choice for accommodation in Jo'burg and we'll be back! "thank you for staying at hoopoe haven.